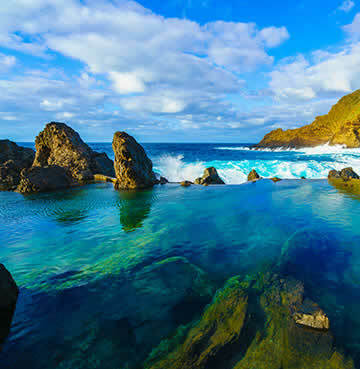 Nicknamed 'the floating garden', Madeira's luscious landscapes act like a homing beacon to holidaymakers. Nature lovers delight over dramatic coastlines and towering mountain tops, while sun-seekers bask in beautiful sub-tropical climes. Wonderfully wild, the idyllic island might be blessed by the sun, but it's very much in love with sea. Surrounded by bright blue ocean, cliffs soar out of their watery depths to heavenly heights – acting like one long jaw-dropping balcony. With countless adventures and experiences to be enjoyed by everyone, here are our favourite things to do in Madeira. 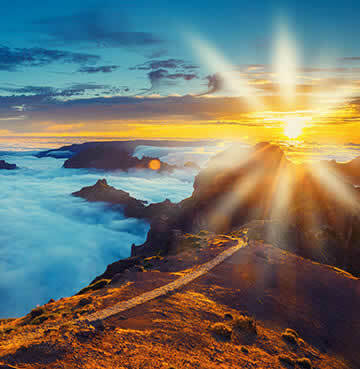 Beyond the capital and mighty mountainous interior, Madeira's charm lies in local life. Long-established routines and time-honoured traditions are just as pertinent today as they've ever been, and visiting rural villages gifts you some truly authentic holiday takeaways. Much of the island is untouched and undeveloped, so rest assured – the communities and settlements you stumble upon are very much the real deal. You can't get more quintessential than the tiny thatched triangle houses of Santana. The talk of many travellers' bucket lists, the white walls, red doors, blue window frames and straw roofs are a well-recognised symbol of Madeira. Mainly maintained for visitors' benefits, the little structures are still a remarkable sight to see – and to photograph! The little north coast village is also home to 'Bordado da Madeira' embroidery. One of the island's most treasured form of arts and crafts, bag yourself a souvenir or two in the local shops before heading out on one of the luscious levada walks. Jaw-dropping Jardim do Mar on the west coast is picture-perfect. Vibrant florals drape themselves across walkways and up the cliff face, filling up every spare bit of space with a kaleidoscope of colour. Wandering around the old narrow streets it'll feel like you're stepping back in time – low-level houses and quirky chimneys still showcasing the town's traditional craftsmanship. Backed by sky-high mountains and lapped by the sea, this little village boasts three pebble beaches and is a unanimous winner among nature lovers! Surf enthusiasts will find themselves in heaven, with wild and wonderful waves challenging even the most experienced boarders. Literally translating to 'garden of the sea', it's a gorgeous way to spend your day. If you follow the coast around the island, you'll find picturesque Porto Moniz sitting pretty between Santana and Jardim do Mar. Formed by lava and naturally filled with crystal-clear sea water, the refreshing natural pools are a great way to cool off and take a break from the sizzling sunshine. Pounded by unrelenting Atlantic waves – this may just be nature's very own take on the idyllic infinity pool. Convenient changing facilities and lockers are a stone's throw from the action, as well as sun beds for those wanting the Madeiran alternative to a 'beach day'. Bliss! Curral das Freiras (Valley of the Nuns) might be fairly high on the tourist radar, but it manages to keep an air of peace and tranquillity regardless. If Porto Moniz is all about the pools, then Curral das Freiras is all about the views. Nestled in the heart of the island, gravity-defying peaks rise above the tiny village below. Dramatic mountains and deep valleys create a cauldron effect, adding to the seclusion of the region – it's no wonder that the nuns of the Santa Clara convent fled here when pirates attacked Funchal! Nature well and truly rules the roost on this Portuguese paradise. The sky's the limit when it comes to outdoor activities, and that's not just because paragliding is on the agenda! From swooping over majestic mountain tops to conquering the island's highest peaks – you're sure to be met with that extraordinary edge of the world feeling on this amazing Atlantic outpost. Kicking things off with one of the most legendary landscapes, Pico Ruivo is Madeira's tallest mountain and just asking for adventure. Somewhere between the lush valleys, towering rock formations and steep ridges you'll discover the indescribable feeling of walking on clouds. If the challenge of the climb doesn't take your breath away – the views sure will! Sheer drops fall down either side of the well-worn path, giving you unobscured front row seats to scenery so beautiful your eyes will hardly believe what they're seeing! The most popular trail starts at the summit of Pico do Ariero, while an easier route begins in the nearby village of Achada do Teixeira. Nature and humans co-exist in harmony with a man-made irrigation system handily curating a perfect network of hiking trails. Levadas were once used to transport water from the north to south, and each has a convenient pathway running parallel to it – making for unrivalled walking routes. 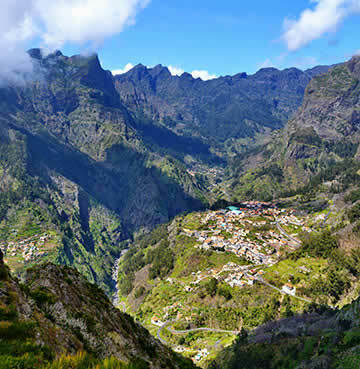 Whether you're trekking Madeira's central mountain chain, luscious laurel forests or wild waterfalls, there's always a levada trail close by to lead you through the volcanic vistas. For those who want to head to new heights without breaking a sweat, jeep safaris do all the hard work so you don't have to! Get up close and personal with wonderfully wild natural beauty in some of the hardest-to-find locations, all thanks to local experts and their trusted 4x4s. The tours are a hugely time effective way to cram all your sight-seeing into one compact day-trip – leaving you with plenty of time to relax by your private pool for the rest of the holiday! Mammoth mountains might turn a lot of heads, but Madeira's captivating cliffs are just as memorable. Plunging hundreds of metres into the sea, the island boasts coastal peninsulas that could rival those of Hawaii! Cabo Girão is Europe's highest cape. Soaring a whopping 580m above sea level, you'll feel like you're flying as you step onto the skywalk. With only a sheet of glass between you and the terrace fields below – it's not for the faint-hearted! Once you find your footing, it's a truly beautiful spot to soak in the wild panoramic views. When you're done admiring the scenery from above, take the cable car down the sheer cliff face to Fajas de Cabo Girão for the extra wow factor! As you make your descent, immerse yourself in the elemental sound of waves crashing against the cliffs. Madeira is never short on surprises, and the peninsula at Ponta de São Lourenço is no exception. Walk to the ends of the earth along craggy coastline and be sure to stop by the brooding Baía d'Abra viewpoint. Strong winds have lovingly sculpted scenes over thousands of years, and hiking the untamed pathways brings you up close and personal to ethereal views. The lunar landscapes on this easterly tip are like nothing on the rest of the island, so be sure to have your camera at the ready! On a clear day, you'll be able to spy the Ilhas Desertas and Porto Santo Islands close by. 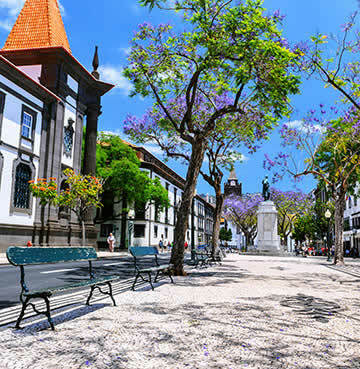 Madeira's colourful capital, Funchal, mixes tradition and modernism perfectly. The Old Town's colonial architecture keeps company with artisan coffee shops and contemporary creations from the newer parts of the city. A montage of small and cosy cobblestone alleyways maze through peaceful streets, past facades of old houses and alongside 15th century chapels and churches. Be sure to wander along Rua de Santa Maria, where you'll discover a quirky collection of 'painted doors' turned canvases, courtesy of local artists. Breathing new life into the Old Town, there's over 200 doors to admire featuring a hodgepodge of handiwork from classical to graphical and everything in between! Funchal unfolds over a series of steep hills and flattened terraces. 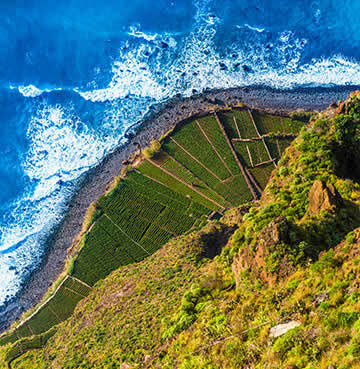 Sprawling down to the sea and edged with majestic mountains, the city maintains Madeira's reputation for emerald green spaces and exotic scenery. Exploring on foot is a traveller favourite, but Funchal has one or two tricks up its sleeve when it comes to getting around. Take to the skies for a bird's-eye view as you fly over rooftops in a cable car carriage. Catch the graceful gondola from the seafront all the way up to magnificent Monte and the beautiful Botanical Gardens. Serving up unmissable vistas and unique vantage points left, right and centre – be sure to have your camera poised for action! The Botanical Gardens offer visitors breathtaking views over Funchal Bay, while sweet scents from the beautiful blooms fill the air. Home to more than 2,000 exotic plants from all over the world, as well as a natural history museum and a bird park, it's a great stop off point for a romantic stroll or family adventure. Once you've had your fill of panoramas and petals, keep heading up to the picturesque parish of Monte. Here you'll find pretty palaces, gorgeous greenspaces, even more jaw-dropping vistas and the iconic Nossa Senhora de Monte church. For the perfect end to a day of uphill excitement, forgo the cable car and opt for a wild ride in a wicker toboggan instead! 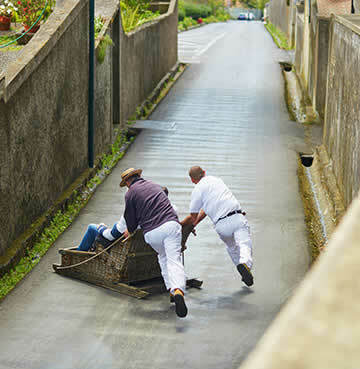 Dating all the way back to 1850, the toboggan was the fastest mode of transport for locals heading to Funchal from Monte. With the wicker tradition well and truly alive, be sure to brave the basket and experience this adrenaline-pumping downhill journey. After all, the novelty of zooming along narrow, zigzagging streets on wooden runners isn't an everyday occurrence! Don't worry though, you'll be accompanied by two men and their trusty rubber-soled shoes – which act as the braking system. Donning traditional dress of white cotton clothes and a straw hat, you'll find yourself in safe hands as they navigate the 2km course down the mountainside. Keeping with local traditions, finish the day with a glass or two of the local tipple – Poncha. Crafted from sugar cane rum, bee honey and fruit juices (lemon, orange or mandarin are most common) it's a cocktail creation you don't want to miss. Refreshing and delicious after a long day of adventure, find a relaxed bar, put your feet up and sip the sweet drink while the sun sets. Perfeito! The island highlands offer holidaymakers awe-inspiring views from every angle, with countless look-out points along the precipitous coastline. A real life nature lover's playground – there's not a bad view in the house! Those gorgeous sights aren't solely reserved for craggy clifftops though, which you'll soon discover if you take to the swelling seas on a blissful boat trip. 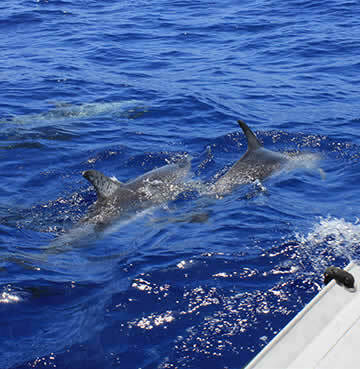 Watch in awe as dolphins dance in the deep blue waters, showing off their acrobatic skills while swimming alongside the boat. A whole host of wonderful wildlife and magical marine creatures call this place home besides the playful porpoise, and if you're lucky you'll spot whales, turtles and seals too. Looking back on Madeira with the refreshing Atlantic breeze in your face, it's a jaw-dropping sight to behold. If you're wanting to add a romantic touch, take the trip at sunset and watch the sky light up with flashes of orange and gold. For a fully-fledged day of adventure, set sail for the rest of Madeira's archipelago. 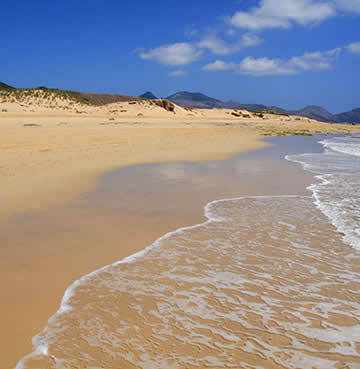 Porto Santo boasts a 7km long beach, and is the perfect stop-off spot for holidaymakers in need of sandy shores. Two hours away by ferry, the ride alone is worth it. Cruising along crystalline waters with second-to-none sights in every direction – sit back and relax as you glide towards another island paradise. Of course, in true Madeiran fashion there's plenty of hiking to be had if lounging on the beach isn't your cup of tea. South-east of the main island of Madeira you'll find the Desertas. Awash with ashes of red, yellow and black hues, rugged rock formations punctuate their coastlines – making them virtually inaccessible. The whole area is a recognised Nature Reserve and home to the incredibly rare monk seal. Try your best to spot the shy species as they splash their way in and out of sea caves. Wolf spiders are also native to the island, but they're definitely not as cute! 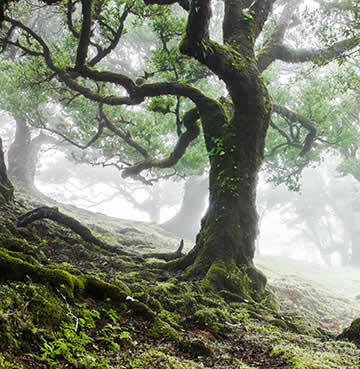 Yet more proof that Madeira's natural environment is one of the most enviable on the planet, deep in its interior hides the fairy tale Laurel Forest. An ancient sight that's guaranteed to awaken your senses, this atmospheric botanical relic is one for the bucket list. Nestled in a valley, the unspoilt natural treasure is a scenic subtropical wonder that feels eerie and enchanting all at once. Wearing its UNESCO World Heritage Site crown with pride, the Laurel Forest wrote the rule book on 'back to nature' explorations – and at 20 million years old, it's fair to say it's something of a trend setter! Explore the forest by following the legendary levada systems through verdant valleys and gushing waterfalls. Madeira is made for road tripping! Its compact size goes hand in hand with the freedom of a hire car, transporting you from one side of the island to the other in a matter of hours. Cruise between rolling green hills, coastal highways and sleepy seaside towns – creating your dream itinerary as you go. Unmissable attractions are dotted all over, handily connected by a series of over 150 tunnels that cut directly through massive mountain ranges. Just passing through them is quite the experience! Prepare for excitable passengers cooing out the window at jaw-dropping panoramas and plenty of pulling over to admire the views for yourself too.